" Carefully combing his ears and tail and wearing his finest red felt boots, a furry young faery named Sneezle prepares for the Midwinter festival in Old Oak Wood -- the oldest faery court in the British Isles. All the denizens of the wood have gathered for this grand winter holiday...but this year something is strangely wrong. By now the forest should be blanketed with snow, but the air remains warm, the leaves have not fallen, and branches remain laden with autumn's fruit. Somehow, the cycle of nature has been halted, and even the faery king, Oberon, cannot fathom why winter has not arrived. From this mystery will come a great adventure, one in which young Sneezle and his best friend, Twig, will confront menacing goblins and an evil sorcerer. 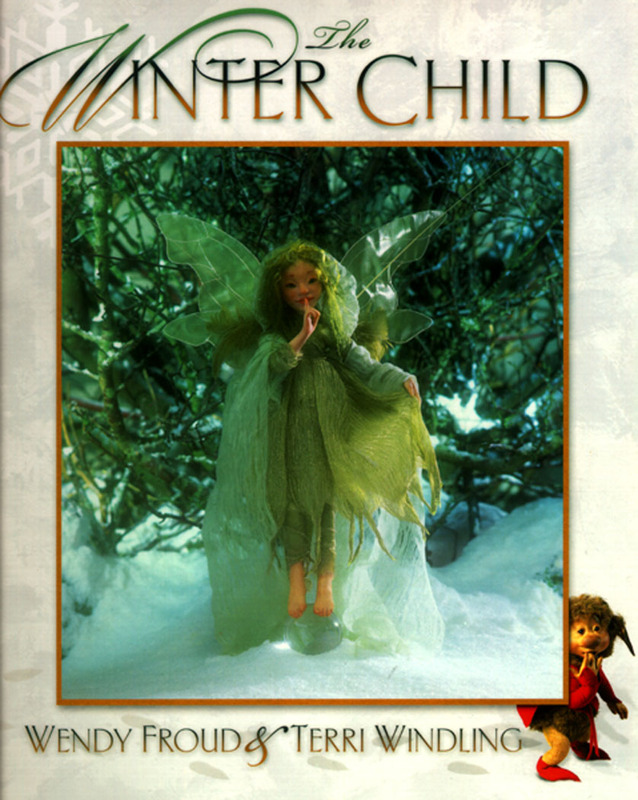 By turns charming, menacing, and hilarious, The Winter Child follows Sneezle and Twig as they bravely ferret out the terrible truth behind Winter's absence and witness a dramatic duel of sorcerers in which the future of the faery kingdom hangs in the balance. In this marvelous collaboration between renowned doll maker Wendy Froud and award-winning writer Terri Windling, the entrancing story twists and turns its way through the magical beauty and ominous shadows of the faeries' world. Art-directed by Brian Froud, beloved creator of such classics as Good Faeries/Bad Faeries, the book's spectacular photographs capture Sneezle, Twig, King Oberon and Queen Titania, the sorcerer Malagan, the Royal Council of Sorcerers, and the faeries of Old Oak Wood, all in such vivid detail that they seem to come alive...as indeed, perhaps, they are. Following the success of Wendy Froud and Terri Windling's first Sneezle adventure, A Midsummer Night's Faery Tale, this new volume opens the magical window of enchantment once more with an extraordinary combination of story and art. A mythic tale of nature humbled by whim and ambition -- and of good and simple souls triumphant -- The Winter Child will be a classic among lovers of fairy tales, fantasy literature, and all things Froudian." Wendy Froud became a doll maker at the age of five and has gone on to make dolls, puppets, and sculpture for such films as THE EMPIRE SRTIKES BACK, for which she helped create the character of Yoda, as well as Jim Henson's THE DARK CRYSTAL, LABYRINTH, THE MUPPET SHOW, and THE MUPPET MOVIE. Her dolls and figures are highly sought after by private collectors around the world. Froud grew up in Detroit and now resides in Devon, England, on Dartmoor, with her artist husband, Brian and their son, Toby. Terri Windling, a six-time winner of the World Fantasy Award, has been a guiding force in the development of mythic fiction and fantasy literature for more than a decade. She is also the editor of Brian Froud's GOOD FAERIES/BAD FAERIES. A fairy and Folklore scholar, she has written mythic fiction for adults and children (winning the Mythopoedic Award for her novel THE WOOD WIFE). She divides her time between Devon, England, and Tucson, Arizona.